Top cowboys and cow horses will take center stage July 6, 2010 in Oklahoma City to battle it out for top honors at the inaugural Battle in the Saddle competition. State Fair Park and the American Quarter Horse Association have teamed to present this first-of-its-kind equestrian event. Battle in the Saddle, owned by Oklahoma State Fair Inc. and managed by AQHA, will be a premier equine competition showcasing five western disciplines. 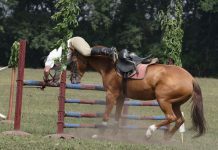 Beginning July 6 and continuing through July 10, 2010, at State Fair Park, competitors will shoot it out in five fast-paced, exciting events: reining, working cow horse, roping, cutting and ranch horse competition. Open to all breeds, horses and riders will compete for their share of more than $130,000 in added money, contributing to an estimated $340,000 in purses. The cutting, reining, roping and working cow horse classes will be recognized as AQHA special events. 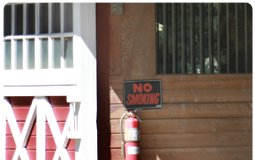 All breeds are welcome but American Quarter Horses competing will receive AQHA points. 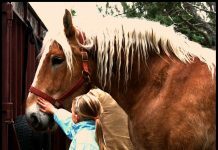 The ranch horse competition is open to all ranches that meet the criteria of the AQHA-Bayer Best Remuda Award. The roping events will be recognized by the American Rope Horse Futurity Association and follow ARHFA rules, which combine times with judges’ scores to get a contestant’s overall score. Horses competing in the cutting will receive National Cutting Horse Association recognition. 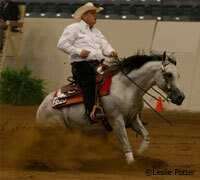 Ancillary reining classes will be approved by the Oklahoma Reining Horse Association. The National Reined Cow Horse Association will be involved, as well. Adding to the excitement of the competition, the United States Equestrian Federation National Open Reining Championship and Official United States Equestrian Team Selection Trial for the United States Reining Team will be the qualifying event that selects the U.S. team to compete at the 2010 Alltech FEI World Equestrian Games. See who will make the U.S. Equestrian Team as reining members go for the gold at the 2010 Alltech FEI World Equestrian Games. To add to the international flair of Battle in the Saddle and the WEG selection trial, the AQHA Youth World Cup will also take place in conjunction with the event. Youth World Cup is a team competition featuring some of the best American Quarter Horse Youth Association members from around the world. Youth exhibitors from 17 nations are scheduled to attend and compete in the 2010 Youth World Cup. Youth World Cup competition alternates between the United States and another host country every two years. In addition to the top-caliber equine competition in the arena, Battle in the Saddle will also feature a trade show. Look for updates on exciting additions to the Battle in the Saddle line-up. Don’t miss the exciting action of this historic equine event! More information, including entry forms, will be available at www.battleinthesaddle.com. This sounds so exciting, I wish I could go see it! Sounds great. Love the title.